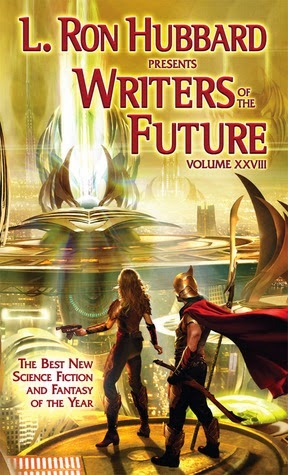 L. Ron Hubbard Presents Writers of the Future Volume 28 is available at Amazon, Abebooks, Barnes and Noble, and BooksAMillion. I avoided this series for a long time because L Ron Hubbard's religious cult scares me. Then, I received two volumes (29 and 30) in exchange for reviews. I adore short stories and this series definitely delivers high-quality stories presented by the winners of the annual Writers and Illustrators of the Future contest. Like many anthologies, there's the occasional tale that I can't get into - not because the writing is poor but because of my inability to relate to the characters or the topic. There are also essays on writing and publishing - some are helpful, reminding me of handy tips and hints, and some are skimmable shameless self-promotions. But, at the end of the day, there are a lot of great writers featured here and no Scientology so I have commenced with reading the series backwards.